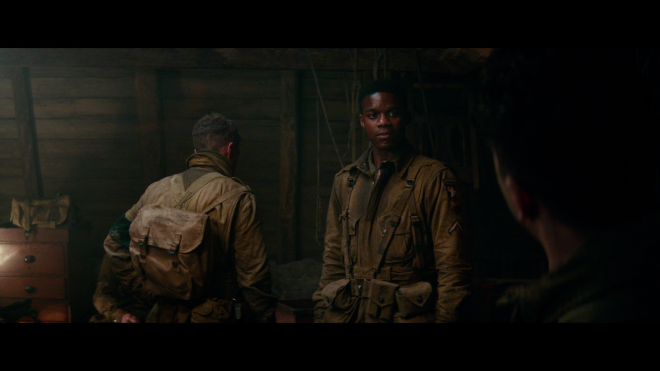 From JJ Abrams' Bad Robot Productions, Overlord is basically the video game movie genre fans have been longing for, the one gamers and movie-lovers alike can agree is actually pretty good and loads of fun. Only problem is that the story is not an adaptation of an existing video game franchise, and the filmmakers have not admitted to even borrowing the high-concept premise from another source. 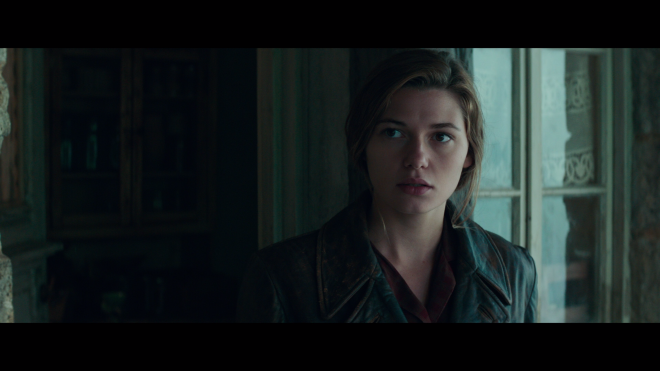 An argument could be made the screenplay by Billy Ray (The Hunger Games, Captain Phillips) and Mark L. Smith (Vacancy, The Revenant) was perhaps loosely inspired by the Call of Duty and Wolfenstein games, which featured Nazi zombies during specific levels of gameplay. But to be fair, the concept of the Third Reich producing an army of the walking dead is not original to the video game industry, dating as far back as Steve Sekely's 1943 Revenge of the Zombies and recently revived into mainstream pop culture by movies like Outpost and Dead Snow. Nevertheless, the story of a squad of paratroopers against a Nazi platoon feels as though playing a game. Right from the opening moments, we're shoved inside a military plane flying over the beaches of France on the eve of D-Day. 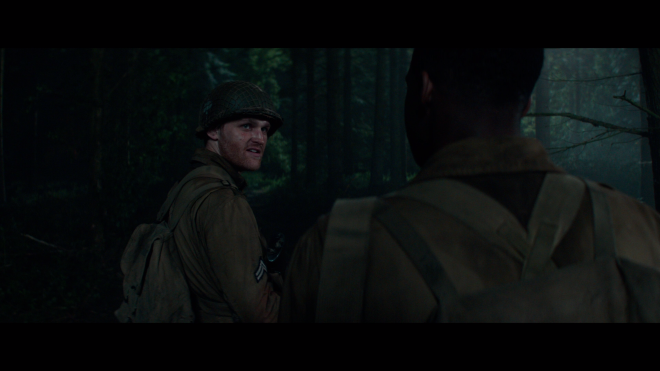 In fact, the action unfolds almost entirely from the one-shooter perspective of PFC Ed Boyce (Jovan Adepo) as the men nervously chitchat back and forth while also introducing other characters and expositing the mission. Even the way director Julius Avery, making his American debut, moves the camera through the dark, tightly-packed belly of the plane seems reminiscent of any number of CoD games. So much so that when the action suddenly erupts, igniting the screen with the loud bursts of explosions and planes crashing down in fiery masses everywhere, I nearly caught myself excitedly moving my fingers as though holding a controller. My left thumb kept pushing the analog stick forward while my right fingers randomly pressed non-existing buttons. There's something to be said about a movie that while completely unoriginal and knowingly borrowing from other sources, still manages to engage audiences on such a fundamental level. Aside from Avery's skilled camerawork drawing us in, the ragtag group of soldiers who survived the initial battle and jump is ultimately the real heroes of this tale, each a distinct personality with a charm in the vein of Saving Private Ryan or HBO's Band of Brothers miniseries. The rugged, stony-hearted Cpl. Ford is the explosives expert carrying enough war-wounds as to treat others as expendable pawns, and Wyatt Russell is great in the role, making the determined officer just likable enough to appreciate his moment of redemption. Although PFC Tibbet is little more than a familiar archetype, John Magaro is charismatic as the coldly indifferent sniper with a heart of gold hiding deep within. In the midst of battle, they enlist local villager Chloe (Mathilde Ollivier) as badass heroine saving her little brother. 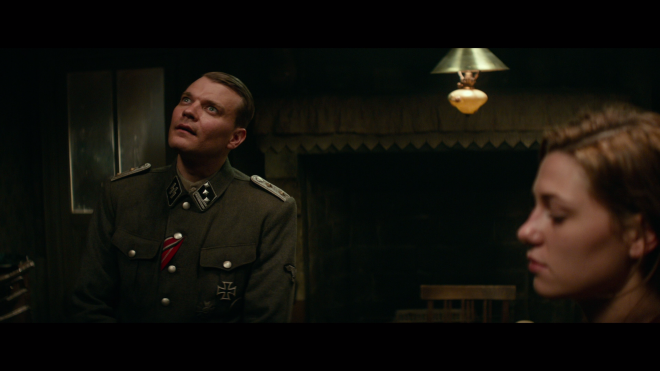 Predictably, they are eventually compelled to unite in their fight against SS Captain Wafner (Pilou Asbæk), a sadistic Nazi officer ruling over the French village, and the twisted scientist Dr. Schmidt (Erich Redman), whose experiments are for producing Hitler's thousand-year army of the undead. 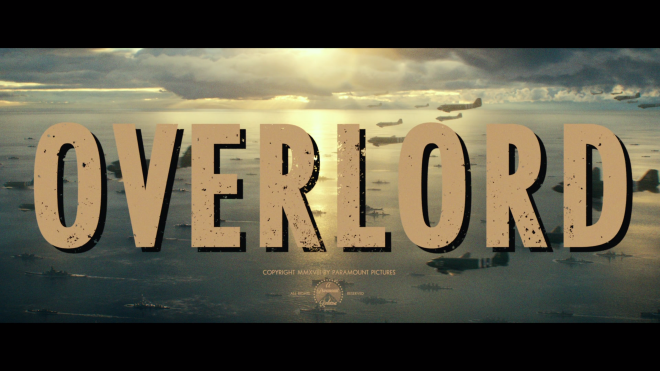 Thinking on it, Overlord is pure absurdity and laughably silly, and Avery and his team appear to embrace this fact with a knowingly, tongue-in-cheek seriousness, as revealed in the opening sequence when the title is flashed over the screen in big, bold but seemingly-damaged lettering reminiscent of a low-budget grindhouse production. The film should be the sort of B-feature taking second billing at the drive-in, but it amazingly works as a standalone horror actioner that funnily, never addresses the walking dead for what they are and it's all the better for it. The focus is on surviving this hidden level of the game, of staying on mission while ruining the Third Reich's plans and advancing to the next chapter. 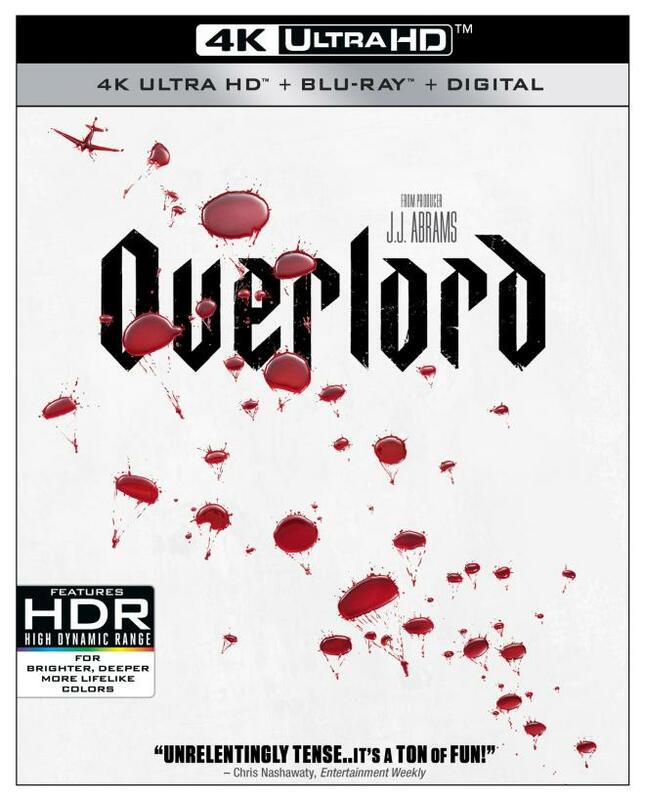 Paramount Home Entertainment brings Overlord to 4K Ultra HD Blu-ray as a two-disc combo pack with an UltraViolet Digital Copy, which can be redeemed via ParamountMovies.com, allowing owners to watch a 1080p HD copy with Dolby Digital Audio. However, iTunes and Vudu users should be to unlock 4K HDR10 streaming rights with Dolby Atmos audio. The dual-layered UHD66 and Region-Free BD50 discs sit on opposing panels of a black, eco-vortex case with glossy slipcover. At startup, viewers are taken directly to a static screen with the usual selection along the bottom and music playing in the background. Nazi zombies invade Ultra HD with a beautiful, occasionally stunning HEVC H.265 encode, outfitting the horror combat flick with an excellent upgrade over the Blu-ray. The movie was shot entirely on HD cameras capable of up to 3.4K resolution, but that data was later mastered to a 2K digital intermediate. Still, the upscaled 2160p transfer lands with a notable uptick in overall definition, exposing the stitching and threading in the uniforms and the canvas material of the belts, straps and other accessories. Viewers can plainly discern the wood grain in Chloe's house and furniture, the minor imperfections around the buildings of the village, and make out every leaf and blade of grass in the surrounding foliage. Each stone in the walls, houses and cobblestone roads can practically be counted, and the smallest object decorating the background is visible, even in the grimy, dark Nazi lab. The 4K video also boasts considerably brighter contrast, which may not be immediately apparent when almost the entire movie takes place at night and awash in lots of creepy shadows. Nevertheless, the pitch-perfect whites are crisper and a bit more brilliant without the slightest hint of blooming. Specular highlights offer the more noteworthy improvement, giving the edge of metallic surfaces a more realistic polish, the slimy, bloodstained covered walls and floors a radiant shimmer and revealing more details within the hottest spots, such as in the light fixtures and the plume of explosions. Brightness levels have also been given a generous boost, bathing the war against the dead in inkier, obsidian blacks while most of the picture seems darker than its HD peer. Still, luxurious velvety shadows penetrate deep into the screen without engulfing the finer aspects of the poorly-lit interiors of the creepy, dingy Nazi lab, providing the 2.40:1 image with great dimensionality and cinematic appeal. As mentioned above, the stylized cinematography of Laurie Rose and Fabian Wagner intentionally falls on the gloomier, more atmospheric side, keeping to the familiar genre tropes. This creative choice noticeably limits and somewhat restrains the palette, but compared to its HD SDR counterpart, this Dolby Vision HDR presentation nonetheless delivers vibrantly sumptuous primaries, particularly the blues in the sky when it's not overcast and the electrifying sparks of the radio equipment. Meanwhile, the greens in the nearby vegetation are now of deeper, more-true-to-life shade, and the reds in blood are a darker garnet but some articles of clothing are a bright candy rose. Secondary hues are also more spirited and animated as the lights of the lab glow a warmer canary yellow, explosions ignite the screen with fiery, reddish oranges and Nazi uniforms are a richer, ash-color grey. The triumphant Allied invasion gets underway with a marvelous, reference-quality Dolby Atmos soundtrack that immediately erupts into action as a swarm of planes fills the room on the eve of D-Day. Each plane can be distinctly heard flawlessly panning between the surrounds, the three front channels and across the overheads, instantly throwing viewers into the thick of war. When shifting inside with our heroic squad of paratroopers, the loud rattling of the plane's metallic interior clinks, clanks and jingles everywhere, establishing a fantastic hemispheric soundfield as aerial explosions and eventual skirmishes on land add to the immersion. In the small French village, heights and surrounds continue to be employed by subtle atmospherics in the distance, voices and screams echoing in the Nazi lab, and gunfire reverberating all around. Death No More (HD, 12 min): A closer look at the makeup and practical special effects, along with some discussion on the weapons. Creation (HD, 11 min): Typical EPK-like piece with cast & interviews extensively talking about the overall production, the plot, characters and the various themes. Death on the Ground (HD, 9 min): More interviews focused on historical accuracies, believable characters, the movie's central antagonist and Mathilde Ollivier's performance. Death Above (HD, 7 min): A detailed discussion on the opening battle sequence. Death Below (HD, 6 min): Similar to the above, only on the story's switch from war to horror. Brothers in Arms (HD, 5 min): Cast & crew praise Julius Avery and J.J. Abrams. As silly as the premise of the Third Reich creating an army of zombies is, Overlord is a surprisingly fun horror combat flick from J.J. Abrams and his Bad Robot Productions. Part of its success is director Julius Avery making the absurdity and explosive action feel much like a first-person shooter video game without actually imitating any known source. Nazi zombies invade the hostile territory of Ultra HD with an occasionally stunning Dolby Vision HDR presentation that nicely adds a few notable improvements over the Blu-ray and an awesome, reference-quality Dolby Atmos soundtrack. Although featuring a puny assortment of bonus features, the overall UHD package is recommended for genre fans everywhere.